With funding from a National Endowment for the Arts grant, the University of Arkansas Community Design Center is taking the lead on a project that aims to complete the vision of Edward Durell Stone, an important 20th century American architect and Arkansas native. 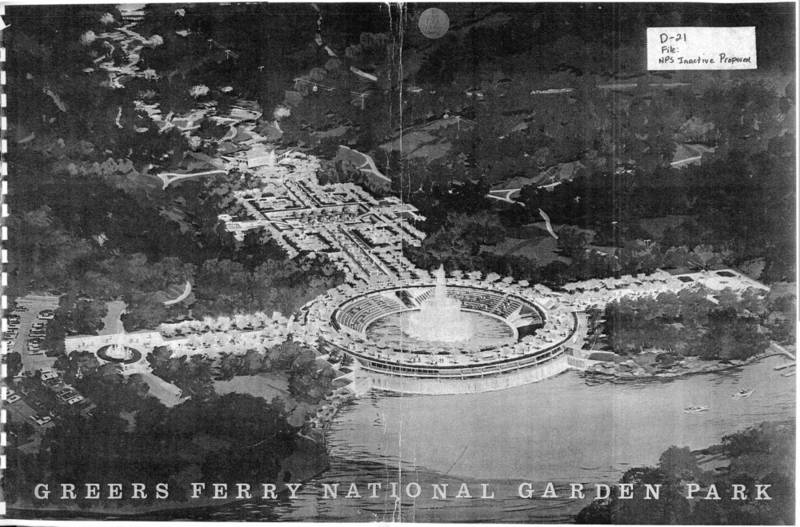 Edward Durell Stone's unfinished plans for a National Water Garden will be updated by UACDC and Marlon Blackwell Architects. The Community Design Center and the project team were awarded a $40,000 NEA Art Works grant to complete Stone’s unfinished conceptual design for a 300-acre garden park of national significance in central Arkansas. The history of this visionary project originally dates back more than five decades, when then-U.S. Sen. J. William Fulbright presented plans to President John Kennedy for a garden park near the dam site of Greers Ferry Lake. In October 1963, just weeks before his assassination, Kennedy traveled to Arkansas to dedicate Greers Ferry Lake, located 65 miles from Little Rock. Today, this lake attracts 7 million visitors annually and consistently rates among the top three most-visited lakes managed by the U.S. Army Corps of Engineers. The idea started with the vision of Herbert Thomas, a Little Rock businessman inspired by the fountains and landscaped gardens at Villa d’Este, constructed in the 1500s in Tivoli, Italy. Impressed with plans by Thomas and Fulbright for the garden park in Arkansas, Kennedy directed the Corps of Engineers to make preparations for the construction. After Kennedy’s death, Fulbright continued to press for the project and commissioned Stone to produce a master plan for the site. Stone, a Fayetteville native and childhood friend of Fulbright, was the renowned architect for Radio City Music Hall and the Museum of Modern Art in New York City; the Kennedy Center for the Performing Arts in Washington; and the U.S. Embassy in New Delhi. In his first draft, Stone expertly crafted a compelling design that integrated the formality and hydraulics of classic Italian water gardens with the natural hydrology and topography of the Ozarks landscape. However, the design was never means-tested and its architectural gestures remain incomplete. Jerry Holmes, Cleburne County judge, said tourism is the top industry in that county. The 40,000-acre Greers Ferry Lake is popular for boating, and the Little Red River attracts those interested in trout fishing. A native of the area, Holmes recalls the lake attracting some 100,000 people for an average weekend in the late 1970s, with crowds for the July 4th holiday often spiking at 385,000 people. As more tourist attractions have popped up across the state, the number of tourists for the county has declined over the past several years. Holmes is excited about the renewed interest and development of this plan that was set aside 50 years ago, and all of the things it could bring in its wake. Such an attraction would bring visitors from across the country and around the world, demanding new hotels, restaurants and other amenities to serve them. Even though it’s been on hold for 50 years, “this will be, still today, the first project of its kind in the United States,” he said. The Community Design Center – an outreach program of the Fay Jones School of Architecture – along with Marlon Blackwell Architect and Ecological Design Group, Inc., will comprise the design team for this project. The Community Design Center will oversee development of the design master plan, coordinate the conceptual design process among team participants, and oversee preparation of the report and graphic production. Marlon Blackwell Architect, an internationally recognized Fayetteville-based architecture firm, will provide architectural design services, including related drawings and cost estimates. Ecological Design Group Inc., a leading landscape architecture and civil engineering firm in Little Rock, will provide assessment and design recommendations with cost estimates related to ecological design, civil engineering, hydraulics and landscape architecture. Members of the design team will provide in-kind matches for professional services. Other agencies involved in this project include ETM Associates LLC, public space management specialists; the Corps of Engineers; and state agencies such as the governor’s office, the Arkansas Natural Resources Commission, the Arkansas Department of Parks and Tourism, and the Arkansas Game and Fish Commission. State agencies will provide $60,000 in funding collectively. The development of programming and operations, as well as design criteria, is scheduled to take place between July and December. Plans for next year include development of the park design master plan, finalization of design recommendations and the master plan, and completion of the feasibility report. Art Works grants support the creation of art that meets the highest standards of excellence, public engagement with diverse and excellent art, lifelong learning in the arts, and enhancement of the livability of communities through the arts. The NEA received 1,515 eligible applications under the Art Works category, requesting more than $76 million in funding. Of those applications, 886 were recommended for grants for a total of $25.8 million.